Awarding various colored belts to signify the achievement of new levels of expertise in karate (and other martial arts) is a relatively recent tradition. The colored belt is said to have been created by Jigoro Kano, the founder of judo, in 1888.The practice was then adapted into other martial arts, including karate. Grand Master James S. Benko of the International Tae Kwon-Do Association states that earning a belt not only indicates an advancement of rank, but an advancement of personal growth. Not every karate school uses all the colors, and the order of the colors may vary slightly. Belt colors can also be interpreted in more than one way. White and yellow belts signify that a student is a beginner. White symbolizes the innocence of a new student that embarks on his journey with no prior knowledge. A yellow belt symbolizes a seedling being adorned by the sun's rays; and also the student opening his mind and allowing the wisdom of his sensai to penetrate his consciousness. Orange, green and blue belts are given to the student already immersed in the study and application of karate. 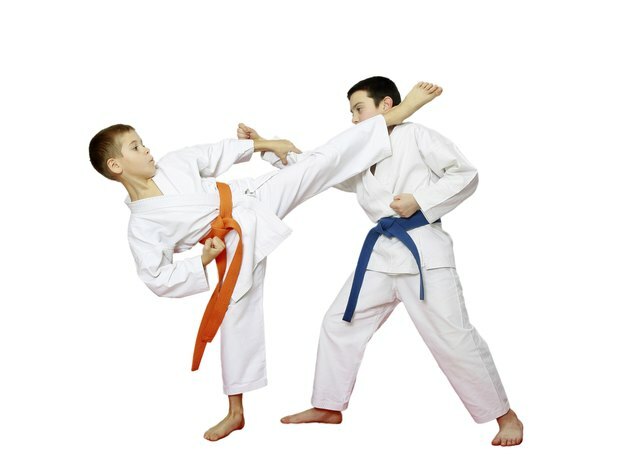 The orange-belt student begins to develop both physically and mentally in his martial arts discipline. Green-belt students have a firm foundation of martial arts knowledge on which to build as they practice and refine their skills. The blue belt is a symbol of the sky, which the young plant tries to reach. The blue-belt student focuses his energy on achieving the next level. As you slowly advance up the ranks, you are awarded the brown and red belts. The brown belt is a symbol of the ripening and maturing of a plant. The brown-belt student is gaining the maturity necessary to advance to the highest levels. He is reaping the benefits of hard work. The red belt can be seen as a symbol of the power of the red-hot sun. A red-belt student must learn to practice caution and control in the use of his abilities. The black belt, the ultimate achievement of martial arts skills, symbolizes the “darkness beyond the sun,” explains the World Martial Arts Center website. Even as he teaches others, the black belt holder continues to broaden his own understanding, continually seeking knowledge and enlightenment. Within the black belt level, a separate ranking system breaks down mastery into degrees, or levels of achievement.